Want to energise your life? Need a bit more get up and go? Fed up with the Friday night collaspse or the 4 o'clock wobbles? Never have the energy to seize the day? We all have the potential for boundless energy and Alyssa Abbey is here to show us how to unleash it. Kiss goodbye to the exhausted evenings flopped on the sofa and say hello to life, love and happiness. Learn how to banish those excuses and increase your physical, intellectual, emotional and spiritual energy. 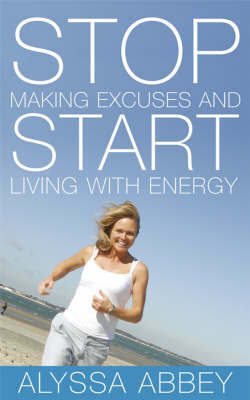 Stop Making Excuses and Start Living With Energy is packed with worksheets, questionnaires and top tips to help you compile a practical and realistic plan for vitality and happiness. At last, simple answers to making busy people feel better!